Myanmar Vineyard is the brainchild of a German entrepreneur who had no experience in the wine trade, but a good sense for a business opportunity. Bert Morsbach brought the first 3,000 vines of European grape varieties to Myanmar in 1998 and had them planted in Loikaw, in Kayah State. The next year the vineyard was relocated to Aythaya, in the Southern Shan State and an additional 10,000 vines were imported and planted. The varieties included Chardonnay, Chenin Blanc, Sauvignon Blanc, Muscat, Cabernet Sauvignon, and Syrah. 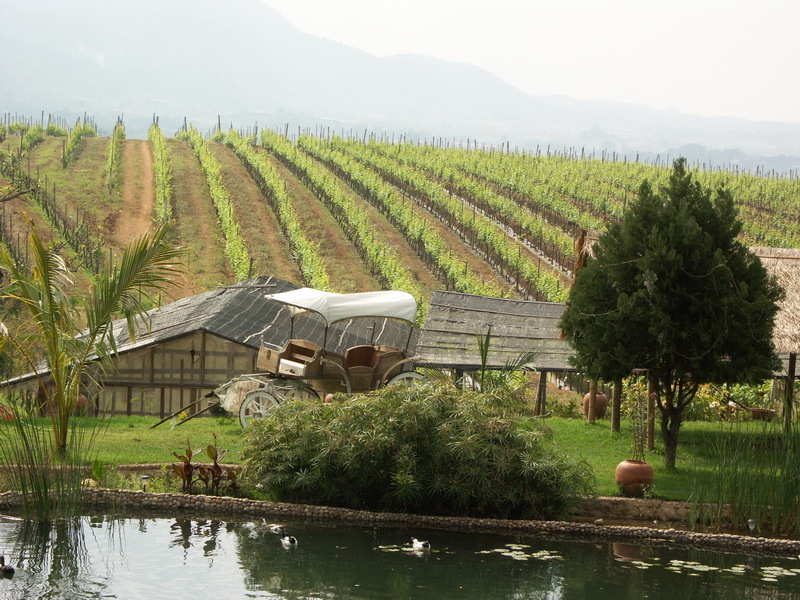 Aythaya Vineyard is located at the edge of the small town of Aythaya, near Taung-gyi, only 40 minutes by car away from the famous Inle Lake, surrounded by the famous Blue Mountains of the Shan Plateau. It’s situated at an elevation of 1,300 m. (4,270 feet)–in fact, the highest vineyard in all of Asia. This high altitude affords the vineyard a much cooler climate than its subtropical location would otherwise enjoy, with temperatures in the dry season (October to May) that range as low as 5 degrees C. (41 F.) at night to 30 C. (86 F) during the day, with minimal rain and humidity and ample sunshine. The soils in the region are of calcareous origin–not unlike the soils of Chablis—contributing to the generally excellent terroir of Aythaya wines. Geologically, the hilly slopes of the Shan States are the Southern extension of the Himalayan Mountains. My wife, Vals, and I arrived at the winery by car, unannounced, about mid-day, and found the director of the winery, Hans-Eduard Leiendecker, free to speak to us for about an hour and give us a tour of the winery. Leiendecker, who is German, had been technical director for Weingut Dr. H. Tanisch (which produces Bernkasteler Doktor, the storied Mosel wine) for 16 years, and in the four years prior to his departure, had won medals for the winery. Late in his tenure there he set aside a hectare on which he planted Blauburgünder (Pinot Noir) to show that the slopes of the Mosel could also produce first-class red wine. Of course, the wine laws for the Mosel do not acknowledge wines made from varieties other than Riesling or Müller-Thurgau, so if produced, it would have had to have been as a Deutscher Tafelswein, but it never went beyond the demonstration stage. After his departure in 2005 the vines were ripped out and replaced with Riesling. Still, this was a demonstration of Leiendecker’s zest for experimentation and challenge, and most probably that zest, combined with a certain Wanderlust, led to his replying to a help-wanted ad in a trade journal for a winemaker to work at a vineyard in Myanmar. The winery faces many challenges that are unique to South-East Asia, and particularly to Myanmar. As Aythaya has only 25 ha. of land leased from the Ministry of Agriculture (on a 20-year lease, as ownership of land by foreign companies is not permitted in Myanmar). While the Ministry (particularly the Myanmar Agricultural Service) has been very helpful and coöperative, but there no further land available to lease, and farmers are not allowed to lease their own land. The winery has therefore turned to contracting growers who had already been producing table grapes, so that they could increase overall production to a more viable commercial level. However, there has been a growing demand for table grapes, and removing land from table-grape to wine-grape production has the effect of raising prices for table grapes, moving the growers to request higher fees for the use of their land, thus increasing costs for the winery. A pretty Catch-22. Several years of working experimental plots of the different varieties helped the winery determine which vines would best work in this particular terroir. Herein lie some of the most difficult challenges. For example, the Chardonnay vines, which ordinarily travel so well to so many places around the globe, have done poorly here. In fact, the usual problems of mildew, fungus, insect pests exist here, and in the hot rainy season are especially devastating. Still, good results from the resulting crops are very promising. Labor in Myanmar poses problems of its own. As Leiendecker puts it, “The workers certainly work hard, but it is the training that is difficult. You train them in a chore one week, they do it well for that week, and the next week they’ve forgotten what they learned and have to be trained again.” Vine pruning and training are innovations in Myanmar, and it will take time for the workers to get used to the disciplines. According to him, new Tempranillo plantings produced ripe fruit for two years running, but strangely, in the third year, there was no fruit-set. This was not only true at Aythaya, but also at another vineyard down by Inle Lake. At present there appears to be no answer for why this has happened, as there was no evidence of disease, mildew, insect attack, or anything else, and it did not occur with plantings of other grape varieties. Other varieties that are presently being experimented with include Dornfelder and Sémillon. As of 2008, Aythaya produced a red cuvée of Shiraz and Cabernet Sauvignon, vines brought from France and planted at the vineyard in 1999. The 2006 Shiraz-Cabernet blend that we tasted was vinified in stainless-steel tanks, and in order to impart some oak flavor and tannin structure to the wine, wood chips were used in the aging of the wine. The result speaks for itself—though well-made, and the wine has good Shiraz typicity, it lacks a good tannin backbone and is meant to be drunk young. However, at $9.00 a bottle at the winery, it is good value (at Myanmar restaurants it sells for $20 to $40). A Holstein 3-step distillation unit built at the Bodensee in Germany was shipped to the vineyard in 2005. An excellent grappa-type of spirit is made from the Moscato and is called “Aythaya Grappino.” We found it to be very well-made as well as tasty and agreeable—very much a grappa, and its flavors are clearly those of the Muscat grape. Among the other challenges of producing wine in a subtropical region is that vines can produce two crops a year. Thus, the vines are always green and productive, with no period of winter dormancy, but the only useful growing season takes place in winter & spring, when the weather is coolest, the sun at its lowest zenith in the sky, and there is the least amount of rainfall during the period of flowering, fruit-set, and fruit development. The danger, as mentioned above, is that under these conditions the grapes can ripen hastily and result in fruit with inadequate levels of acid. However, once that crop has been harvested the vines will immediately set to producing a second crop in a much warmer and much more humid season that includes a higher solar zenith and monsoon rains. This crop is unusable for the production of wine. A factor to be considered is that European vines with two growing seasons a year do not enjoy the usual winter dormancy that they enjoy in more moderate climes. It is not yet known how this may affect the quality of the fruit, or the eventual tendency of the vines to develop long-term fungal disease, root-rot, or other conditions. Leiendecker ordered and now has in place two oaken Fuders of 1000 l. capacity each in which to age his red wines, thus obviating the need for wood chips. His choice of Fuder over barrique may be based both on his familiarity with the Fuder from his days as winemaker in the Mosel region of Germany, but also the economics of buying barriques of 225 l. every few years, or using Fuders for a much longer period of time, thus amortizing the cost of oak containers over a longer period. This is driven, of course, by the high cost of shipping from Europe. The tour of the winery was quite interesting, as the plant is still evolving, and new equipment is still being installed, including a high-pressure, high-speed bottling system with screw-cap machinery (the winery has, until now, used plastic corks). The wine is fermented in temperature-controlled stainless-steel vats, of which there are now a total of six. All this should be ready for production in time for the next vintage, in May of 2008. It remains to be seen whether or not Aythaya Vineyard can live up to the expectations of its founder, Bert Morsbach, or its vineyard director, Hans-Eduard Leiendecker. Certainly the investment wherewithal has been provided, the technical talent is very high, and its early results look very promising—better, in fact, than wines that we’ve tried in Thailand, Vietnam, and India. The challenges are unique and demanding, but we expect that with time a very good reputation will be established not only in Myanmar, but perhaps globally. Subtropical winemaking is being experimented with on several continents, but here, at a nearly mile-high winery, the promise looks like it can be fulfilled. Meanwhile, the winery has been gearing itself for visitors, and has put in a swimming pool, a restaurant, and a wine bar for tastings. Accommodations nearby can also be arranged by the winery for those who wish to stay overnight. 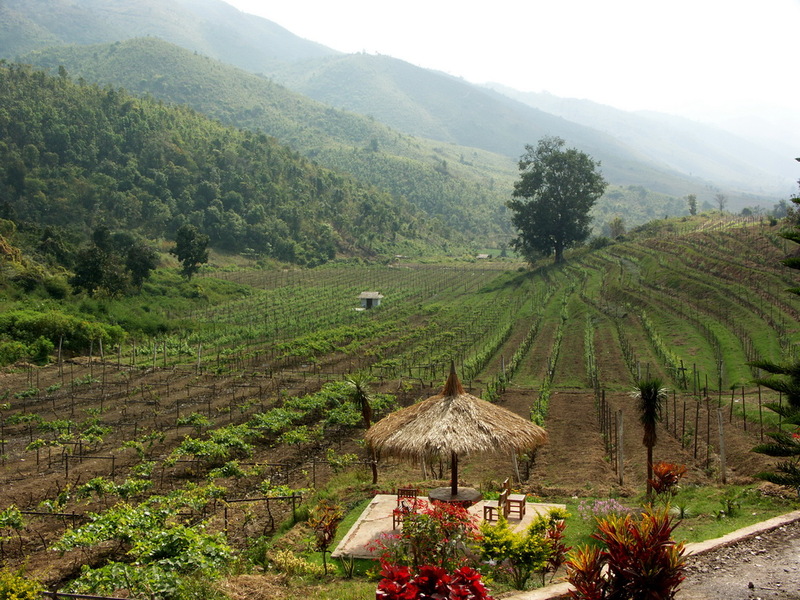 As of late 2009, the founders now claim that it is possible to produce quality wines in the Southern Shan States of Myanmar. Its development to that point was quite rapid, starting with the first viticulture research in 1997, bottling the first wines in 2004, and preparing to export their wines by this year. This entry was posted in Vineyards, Vinification, Viticulture, Wineries and tagged Asian Vineyard, Asian Wine, Asian Winery, Aythaya Vineyard, Bert Morsbach, Burma Winery, Hans-Eduard Leiendecker, Myanmar Winery, Vineyard terroir on 1 May 2010 by JoseM-L.